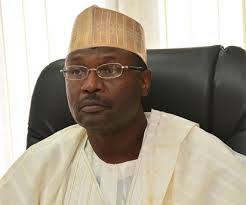 Mahmood Yakubu, chairman of the Independent National Electoral Commission (INEC), has asked senators-elect to start work early. He spoke while presenting certificates of return to senatorial candidates who emerged winners in the February 23 polls. The event is taking place at Africa Hall of the International Conference Centre (ICC) in Abuja. “For the commission, we are glad that we are presenting the certificates of return to our lawmakers,” Yakubu said. “As a matter of urgency the commission will begin work of post-2019 election review and roadmap for 2023. I want to assure you that we will continue to work with the national assembly to review and strengthen our electoral laws. The presentation of certificates to the newly elected house of representatives members is scheduled to hold at 2pm. INEC had earlier said only those whose names appeared on its website as winners of the election would be presented with certificates. The name of Rochas Okorocha, governor of Imo state, who was declared winner of Imo west senatorial election, was deleted from the list after the returning officer said he was forced to declare Okorocha winner.